In our Sindhi school in the 60s, nobody had an idea that we Sindhis were an endangered species and that by the 80s,just two decades later, there will be no Sindhi experience to feel or to talk about, at least in the big cities. We, in our school, had learnt Sindhi Maths, and even today, in my 60th year, while counting, mentally I use Sindhi tables, Sindhi numbers and words. We also had proper Sindhi joke books, Sindhi riddles, Sindhi comics and Sindhi thrillers, which we called Jasoosi novels. I grew up reading Sindhi books. Hundreds of books lined up my dad's library. Those days there were libraries and book shops run by Sindhis, apart from libraries in Sindhi schools and colleges. In those early days books were cheap. A 200 page novel would cost Rs. 3. And there were book shops you could buy Sindhi books from. I remember reading Surg Ji Golah (a search for heaven) by Mohan Kalpana which was a fantasy that really shook me up. Kala Prakash's short stories brought a lump to my throat, as did Krishan Khatwani's novels. We read Mandrake's comics and detective stories from Chandulal Jaisinghani. It was a fullsome fare for an intellectual's diet. At that early age I was not that much into poetry, but as we grew older we discovered Hari Dilgir's poetry, Shaikh Ayaz's roaring words, and Narayan Shyam's poetic wisdom, and much later came to read Arjan Hasid, Krishin Rahi and Vasdev Mohi. 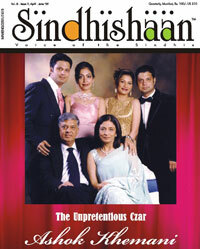 We also read dramas of M.U Malkani, Moti Prakash and later some comedies from Vasdev Nirmal. The rich Sindhi experience of those days had an icing on the cake; the great Sindhi theatre. From Dayal Asha's shadow plays to Ramesh Janjani's revolving stage, from great comedies of Budho Advani to bare- stage experience of Jaswant Kumar, the Sindhi drama was a stimulating experience. S. P. Menghani who continues to be active on stage, gave Sindhis some memorable experience, so did Madan Jumani. There were many other great names like Shashi Bolaakani, Amar Chandnani, Ramesh Mehta, Srichand Makhija, and so on, and we children got a glimpse of a larger world through them. Famous plays like Yaad kandaah, Dis paise ja rang, and Palau Pali were great moments that made history. Most Sindhi colleges too hosted Sindhi one-act plays competitions and stars from Bollywood were invited to judge these plays. The times were young and exciting. A very special ingredient of the Sindhi experience of those days was a Sindhi old man pushing a four-wheeled cart and shouting….. “Chollaaaa….dabalahhh”, the pure Sindhi chana-pattice-bread! That Sindhi bhau, in his yellowing white kurta pyjama, would push his cart into our colony at Worli sharp at 5 in the evening. People would be waiting, some even with plates and pans to carry the delicacies home. There was the classic cholla-dabal, with sanah pakoda, mirch pokada, bheea pakoda, topped with hot gulab jamun, everything under a few pennies. Sunday mornings were the event for pakwan-dal or kadhi-chanwar, accompanied by sweet boondhi. Sunday evenings were reserved for teevan-phulko, the one and only kadai ghosht bought diligently on the Sunday morning. An occasional visit to Colaba would be definitely followed by a visit to Kailash Parbhat for – gol-gappa, dahi-vada and kulfi-falooda. During Diwali, mithai from Tharu still is a must item although the prices have gone up more than tenfold. Songs of Bhagwanti Navani and Satram Rohira and Bhagat of Bhagwan Chawla still ring in my ears as I write this. Bhagwanti sang, 'Hik Sonn Jo Rupayo, Allaah re Allah,' and made every one dance to her tunes. Master Chander sang 'Anjya ta maan dandhiri ahyan..' These songs, sung in the midst of thousands of devoted Sindhis, fill me even now with devotion - sacred and holy. Bhagwan Chawla sang Sant Kanwar's 'Naaley Allakh je Bedo Paar Munhinjo..' and made every one ecstatic. Much later came Runa Laila from Sindh with 'Dama Dum Mast Kalandar' and the Sindhi janta went absolutely crazy. Abida Parveen too made her grand appearance with Sindhi kalaams from Sindh. Later Ghansham Vaswani sang some classical Sindhi bhajans and became a darling of the community. Kajal Chandiramani with her deep resonance gave us some lovely geets and gazals. In the 70s I remember attending a Chaunki of Dada Ram Punjwani and I literally saw miracles happening all around me. Sindhi women just weeping, dancing and laughing at his magical songs. He infused so much energy and spirit in his Chaunkis with his humour and human touch. Now in the first decade of the millennium I'm not in touch with much of the Sindhi music, but I've heard some great new Sindhi voices like Dushant Ahuja, Bipin Sadhwani and so on. Community elders have come to the opinion that Sindhiat now can be kept alive by this voice culture of songs and laadas, music and masti. My rich Sindhi experience, lived over half a century, cannot be complete without the mention of a few pure Sindhi phenomena that have affected me deeply. One is my very first visit to Sadhubela at Mahalaxmi. The very name inspired in me the feelings of mystery and wonder and enchantment and sacredness. I was about ten years when I first visited Sadhubela and I remember getting Dhodho-chutney as a blessing from the Master. Some celebration was in progress and we all sat on the marble ground and my mother had her head covered with her sari. Much later in my fifties I visited Sadhubela again with my wife and the deep childhood memories were revived. Then there is the Baharanasaheb. I remember on the Chetichand in an event organized by our colony, a tall big man wearing a pink turban was dancing gracefully in a procession full of earthen lamps. He played the shenai while dancing and the procession went around every Sindhi household and the women would come out and offer some sweets or I don't know, maybe some money, but that pink turban huge man still occupies my memory. Then I love Sindhi sherwani. Mali sahib made it immortal. It has a certain grace, looks classy and falls well. I would prefer the sherwani to a full-suit any time. I also love the custom Sindhis follow to honour their guests by putting a shawl, known as Dushalo or Ajrak around him. It fills me with tenderness and has a grace of its own. Lastly, I love the idea of Palau paayo. At the end of each Sindhi event they have been performing this ritual of palau-paayo which is so tender and heartfelt that each time it is sung my heart is filled with tears of joy and gratitude. Everybody has to hold out in both hands, the end of his sari or shirt, with one person singing out the prayer. Satram Rohira used to perform this ritual very well. Dadi Paru Chawla also has a great style of performing the palau payo. It is really a soul stirring gift to he Sindhi community.